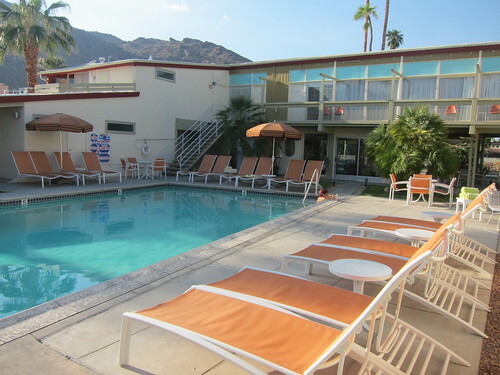 And if that isn’t enough to satiate your Mid-Century Modern appetite, Palm Springs itself exists as a mecca. We were lucky to have historian Michael Stern with The Modern Tour, himself an author of a Julius Shulman book and even documentary, show us an impressive survey of the stylings of the area’s architecture and the mentality behind each of the designs. 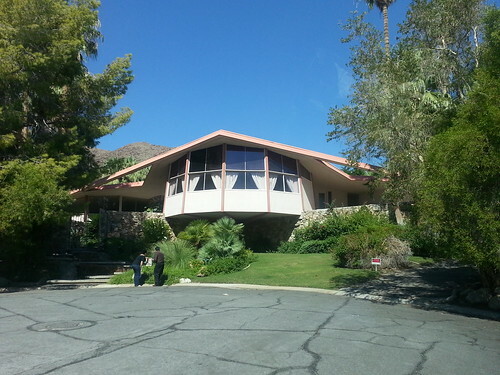 In fact, they are very much a part of the fabric of Palm Springs – so much that there exists an ordinace that no buildings are to have more than one story unless grandfathered from before it came into law. The cause of this is the community’s deference to the San Jacinto mountains and their shared view of them. In a slightly truncated version of the normally 2.5-hour tour, Stern took us to one of seven of Donald Wexler’s Steel Houses, with a 1400-square-foot floorplan designed to feel twice the size thanks to details such as glass doors and paneling, interior walls that stand short of the ceiling, and more. Now a registered historic place, these houses built for everyman went for just $14,000 when built in 1962. A lot of the beauty of Palm Springs is the community’s fruition as a second home away from home. Other breathtaking architecture we drove by included the House of Tomorrow, where Elvis and Priscilla Presley spent their honeymoon. It was to be the site of their actual wedding; however, that tip was leaked to the press and they instead eloped to Las Vegas. Richard Neutra’s Kaufmann House was quite a story in godsent restoration, with a millionaire couple going insofar as to invest, well, millions in the formerly debilitated residence including reopening a mine in South America to excavate the original stone used to build the fireplace. And that second story? It was grandfathered from prior to the city’s 1-storyordinance. Prior to Modernism, Palm Springs embraced Spanish Colonial-style architecture, and you can see the hybrid of these two styles throughout the city. The house Marilyn Monroe leased exhibited this style, as well as the ever-charming, 8-room The Willows Historic Palm Springs Inn – a perfect getaway with a waterfall-view in the breakfast room. You can rent the room in which Marion Davies stayed. Clark Gable, Albert Einstein and Carole Lombard also stayed here. The restoration job on this hotel is itself a fabled story, with the restorers, current owners and innkeepers Dr. Paul Marut and Dr. Tracy Conrad providing their guests not only hospitable but personalized service. Other highlights of the tour included a drive by quite a few celebrities’ houses, but the focus remained on Modernist architecture. For your immediate fix on these stylings, you may want to head on over this weekend for DOCOMOMO Tour Day, which actually presents architecture tours over 4 days (October 5-8). 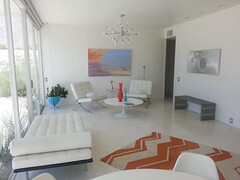 Otherwise, Modernism Week is February 14-24th – but it’s always packed so be sure to make your bookings ASAP! 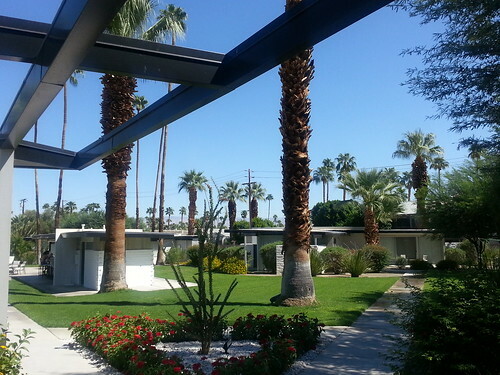 But no matter when you visit Palm Springs, you can always indulge your curiosity for Modernist architecture. 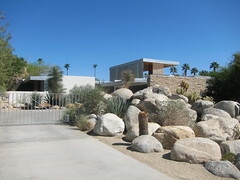 It’s as easy as getting a free architecture tour map from the Palm Springs Visitor Center. 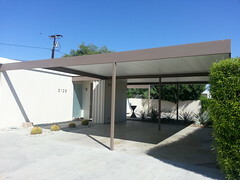 You can also download the Mid-Century Modern Architecture Tour Mobile App from the Palm Springs Modern Committee, which has guided tours of over 80 mid-century Palm Springs landmarks, profiles of 12 leading architects and video. Since I’ve been only once, I can’t wait to revisit Palm Springs to not only gaze at some more designs, but live within a thus-styled oasis. It’s like being taken to a far-away place in a different time. Stay at Del Marcos Hotel and the architecture tour were hosted. This entry was posted in Hotel, Palm Springs, Travel and tagged @palmspringsca, Albert Einstein, architecture, CA, Carole Lombard, Clark Gable, Del Marcos Hotel, desert, design, LACMA, Mad Men, Marion Davies, Michael Stern, Mid-Century Modern, Palm Springs, Paul Marut, The Modern Tour, The Willows Historic Inn, Tracy Conrad, Visit Palm Springs, William Cody. Bookmark the permalink.